It’s been a rough day. A rough few weeks actually… I am an adoptive mom of the sweetest 18 month old boy ever to grace this planet, and my husband and I have started, but are at the beginning of the process for our second child. My doctors have told me that I have only about a 5% chance of ever becoming pregnant, and that if I did, the chance of a tubal pregnancy is higher because of several issues with my reproductive system. I am blessed to have a great family (on both sides) and wonderful friends, but lately, I’m feeling surrounded by pregnant women and new moms, and am really struggling with my infertility. I know this feeling can sometimes be exaggerated, but seriously, since the middle of September, one of our good friends and my sister-in-law have had babies, and four out of six women in my playgroup are pregnant. I spend several hours each week in conversations with women who are expecting their second child, and am growing weary of listening to discussions of pregnancy and childbirth when I feel like I have little or nothing to contribute. I want to be supportive of my friends and family, and I don’t want to guilt them out by mentioning how much I would love to be pregnant, even if it meant round ligament pain, fatigue, nausea, labor pains, weight gain, etc. I just feel very alone, I haven’t been able to find an adoption support group in my area and so I don’t really have many adoptive parents around to commiserate with. Becoming a mother through adoption has been an amazing and humbling experience, I love my son and honestly do love being an adoptive mom. I’m just feeling like a square peg in a round hole, like I just don’t fit, and wanted to vent these feelings to a group of women who might know what I’m going through. Thanks for the chance to vent. Sorry you are going through this. I find this time of year hard as well. I have been struggling with infertility over 11 years and over 2 years of waiting to be chosen for adoption. It is a hard bite to chew. Especially if celebration is in order for a family member or even a close friend. My birthday is in September and I usually spend it depressed that another year has gone by and We are still waiting to start our family Vent all you want because in my opinion we deserve that right. I am so sorry, I know how isolating it feels to be an adoptive parent (or parent-to-be, in my case). Even for my close friends who have already received their forever child, they don’t feel like they fit in at typical New Mommy groups, etc. We are fortunate to have an adoption support group in our area. It’s how I met these great women and we’ve become close friends. Without them I’d feel so isolated. I’d be happy to be your friend through this. Please feel free to personal message me, I’m here anytime you want to talk or vent. Take good care. I know exactly how you feel…. My son is 3 and we adopted him at birth. My husband and I have been married for almost 17 years and had only one pregnancy that ended in miscarraige at 7 weeks. That was 5 years ago. I cannot recommend getting to know other adoptive families, especially if they have kid’s your son’s age. Without them, I’d be lost. Check your state’s specific group on this forum to see if there are any groups around you or anyone willing to participate in a new one. Also, ask around. People know people….. Maybe a sibling/friend of someone in your play group has adopted and you could meet some people that way. 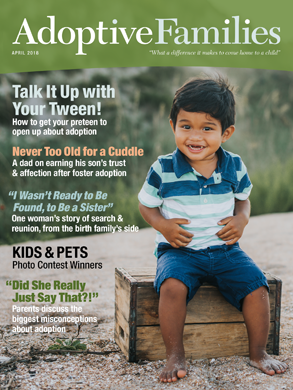 People who birth their children do not even realize there is a need to connect with other adoptive parents, but I believe it is vital. Not only for you, but for your son to have friends who are adopted. He won’t feel so alone in his process that way either!! Praying you find some support. Feel free to PM me anytime!! and they may have a group near you. A few signs at church or notices in bulletins, grocery stores etc may help you find moms. Also libraries often have rooms you can meet in. Reach out there are moms looking for you. It’s OK to not join in talks about pregnancy. You can always say I want to go sit (walk whatever) for a few moments. I’ll be back. I totally feel you! It seems like every time I turn around someone is getting pregnant. It’s a tough road. I have been struggling with this for almost 2 yrs. I have PCOS and endometrial hyperplasia. I have now pretty much been told by the fertility clinic not to come back until my OB gives me the Ok to start trying again.. I pretty much feel like I got kicked out of the clinic lol.. The holidays were really tough for me I have two sister in laws that are pregnant, two cousins and a friend. So of course that was all the buzz around the dinner table. I couldn’t help but get upset one night at a family dinner, a few days later my mother in law and I had a chat and she told me that it wasn’t fair that she couldn’t be excited about the new baby that my brother in law will be having in May..I wasn’t really sure what to say to that. I never said that no one couldn’t be excited about it. I know I will get through this and be on my way to being a Mom it’s just a really bumpy road… and frustrating that some people don’t understand what were going through. I try to do a lot of self talk or try to zone people out when they start talking babies.. lol.. I try really hard to think about the good things I have in life like an awesome husband who would do anything for me.